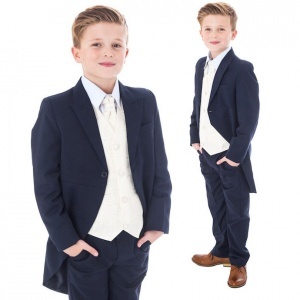 Boys navy & ivory deluxe scroll swirl 8 piece slim fit tail jacket suit, for baby boys, toddler's and older boys, the perfect outfit for any special occasion including a christening, wedding as a pageboy / guest, formal occasion etc. 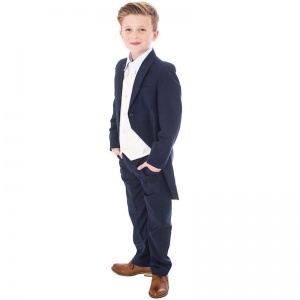 Jacket: Fully lined navy slim fit jacket with tails on rear, single breast pocket, centre button fastening with buttons on cuffs. 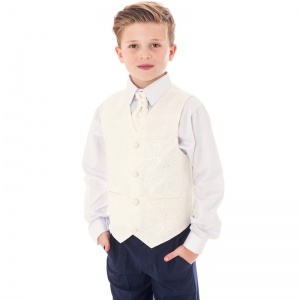 Ivory Waistcoat: A fully lined deluxe ivory waistcoat with a large scroll swirly pattern, double pockets, 3 centre buttons, adjustable strap/buckle on back for perfect fit. Ivory Cravat: Deluxe ivory cravat with matching scroll swirly pattern and an actual diamante in the centre, velcro fastening at the back, complimenting the suit perfectly. Handkerchief: Matching square ivory handkerchief, the perfect accessory to be placed in the jacket breast pocket. Navy Waistcoat: A fully lined plain navy slim fit waistcoat, double pockets, 3 centre buttons, adjustable strap/buckle on back for perfect fit. Tie: Satin effect navy striped tie, elasticated neckband, complimenting the suit perfectly. 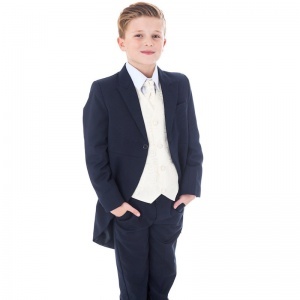 This navy & ivory tail suit is made of a light-weight fabric with a slim line cut giving a high quality, comfortable fit. Stitched to a high standard with great attention to detail. Dry clean only. 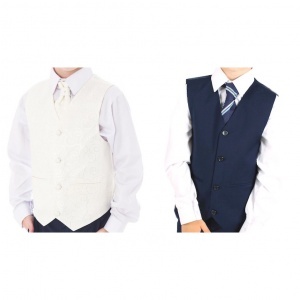 This is the perfect combination suit so you can mix and match the waistcoat attire to suit the occasion.